Using the combination of a horizontal running mattress suture with intermittent loops achieves both good eversion with the horizontal running mattress plus the ease of removal of the simple loops. This combination technique also avoids the characteristic railroad track marks that result from prolonged non-absorbable suture retention. The unique feature of our technique is the incorporation of one simple running suture after every two runs of the horizontal running mattress suture. To demonstrate its utility, we used the suturing technique on several patients and analyzed the cosmetic outcome with post-operative photographs in comparison to other suturing techniques. In summary, the combination of running horizontal mattress suture with simple intermittent loops demonstrates functional and cosmetic benefits that can be readily taught, comprehended, and employed, leading to desirable aesthetic results and wound edge eversion. The unique feature of our technique is the incorporation of one simple running suture after every two runs of the horizontal running mattress suture [Figure 1]. Using the combination of a horizontal running mattress suture with intermittent loops attains both good eversion and hemostasis with the horizontal running mattress plus the ease of removal from the simple loops. This combination technique also achieves fewer characteristic railroad track marks associated with the horizontal mattress that result from prolonged non-absorbable suture retention. Without the intermittent simple loops, suture removal is quite challenging as the suture becomes buried and difficult to retrieve and remove. 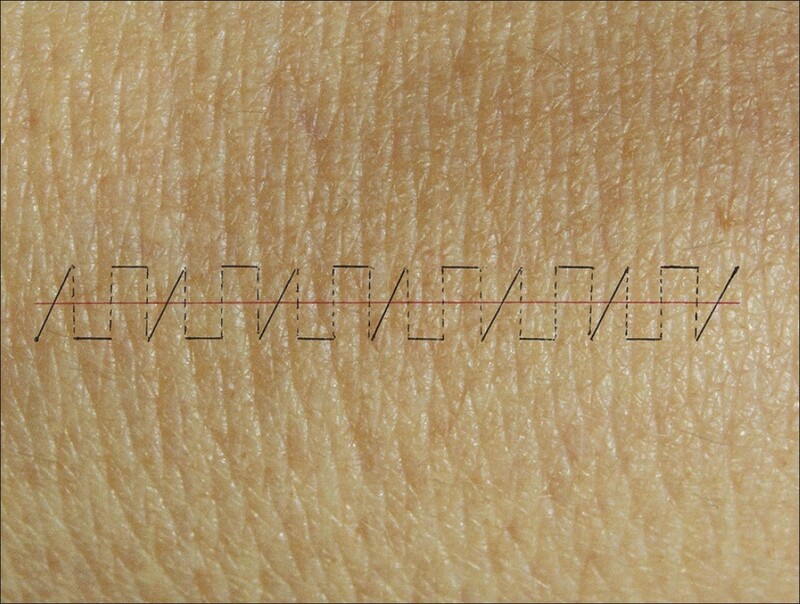 The horizontal running mattress sutures have minimal contact with the epidermis and do not crossover the incision line until the intermittent simple loops are inserted across the incision. This allows easy removal of the stitch, which avoids a major drawback of the standard horizontal technique. To demonstrate its utility, we used the suturing technique on several patients and analyzed the cosmetic outcome with post-operative photographs in comparison to other suturing techniques [Figure 2]. We present a simple modified technique for the running horizontal running mattress suture that facilities suture removal when approximating wound edges using non-absorbable nylon or prolene sutures. Our technique can be accomplished by placing one intermittent simple loop after every two running horizontal running mattress sutures and continuing this pattern throughout the incision line, finishing with an instrument tie. A non-absorbable nylon or prolene suture is inserted at one end of the wound and two horizontal running mattress sutures are consecutively placed in the dermis and then an intermittent simple loop is placed from one side of the epidermis to the other. The sequence is then repeated until the incision line has been closed. At the time of suture removal, simply cut the visible suture from the intermittent simple loops and then pull from the free ends of the horizontal running mattress throws of the suture, which become more visible after cutting the simple loops. This technique makes stitch removal more comfortable for the patient and can be performed more quickly by the medical staff due to relatively easy access of the simple loops. Thus, the incorporation of simple loops inevitably avoids unnecessary trauma during suture removal, especially in patients those who have poor wound healing and those that scar easily. We find this to be especially useful for improved cosmesis in sensitive areas, such as the face, and for better, effortless wound eversion, adequate wound healing, and minimal swelling and inflammation to create a thinner scar compared to the running horizontal running mattress and simple running sutures alone. This suturing technique has predominantly been used in all cases for primary closure after Mohs micrographic surgery in our out-patient dermatologic surgery clinic. Although, this variation is ideal for any wound incision, we emphasize the need to avoid over-tightening the suture to minimize the risk of necrosis and tissue strangulation and to facilitate stitch removal. This technique can cover a large area of the wound and can be performed more rapidly than the horizontal mattress method since there is no need to tie off each interrupted stitch, thus, facilitating suture removal. In summary, the combination of horizontal running mattress suture with simple intermittent loops demonstrates functional and cosmetic benefits that can be readily taught, comprehended, and employed, ultimately leading to desirable aesthetic results and successful wound edge eversion. It is recommended for all surgical skin sutures especially, cosmetically sensitive areas, such as the face. This technique can also be useful in areas of high-tension, wounds at high-risk of dehiscence, or places when the suture can be buried and difficult to retrieve. It may also be used to close large wounds and when time is of the essence. 1. Adams B, Levy R, Rademaker AE, Goldberg LH, Alam M. Frequency of use of suturing and repair techniques preferred by dermatologic surgeons. Dermatol Surg 2006;32:682-9. 2. Moody BR, McCarthy JE, Linder J, Hruza GJ. Enhanced cosmetic outcome with running horizontal mattress sutures. Dermatol Surg 2005;31:1313-6. 3. Krunic AL, Weitzul S, Taylor RS. Running combined simple and vertical mattress suture: A rapid skin-everting stitch. Dermatol Surg 2005;31:1325-9. 4. Eleftheriou LI, Weinberger CH, Endrizzi BT, Ray TL, Chow S, Tsang MW, et al. The victory stitch: A novel running v-shaped horizontal mattress suturing technique. Dermatol Surg 2011;37:1663-5. 5. Wang SQ, Goldberg LH. 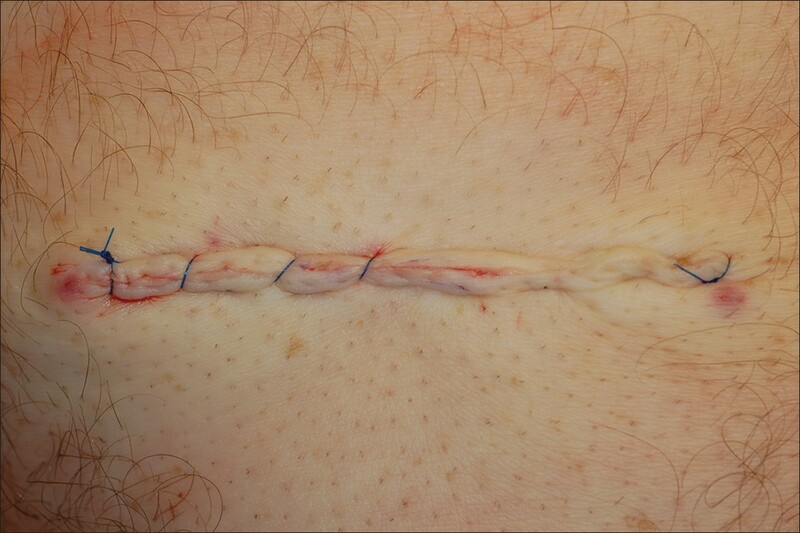 Surgical pearl: Running horizontal mattress suture with intermittent simple loops. J Am Acad Dermatol 2006;55:870-1.